Crackling, frosty leaves under our feet and the strange non-light of a ‘Super Blood Wolf Moon’ add to the thrill of our pre-dawn foray to check live-traps set for pine martens in Crom’s winter woodlands. 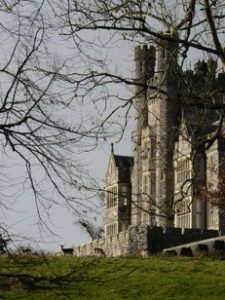 Crom is a magical National Trust property in Fermanagh, Northern Ireland. As National Trust volunteers, my friend John and I are following the bobbing head torch of PhD student Josh Twining on his quest to catch animals for his radio-tracking study. Although we have done our own studies of pine martens in Scotland over many years, this is a new experience for us; and keeping up with Josh – who moves through the pitch-black woodland like a panther in a hurry – is the first of many challenges we face. Conducted under a special licence, Josh has been tracking Crom’s pine martens long enough to know some of them as old friends. One of them – adult male PM01 – is waiting for us in one of the traps, having made a cosy nest from the hay and moss provided for him. He and Josh seem to know each other well, for the sedation, handling and collar-fitting proceed calmly on both sides; and PM01 is soon returned to his nest in the trap to recover from the anaesthetic. Half an hour later, with the trap door locked open and the newly-fitted collar ‘pinging’ quietly on the radio receiver, we retreat behind a tree to wait for PM01 to emerge. After a few minutes, an alert face appears to check that all is safe: erect, prominent ears give the face a triangular, foxy shape, with beady black eyes above a delicate snout, below which glows the marten’s distinctive creamy-yellow ‘bib’ between the powerful fore-limbs of an agile tree-climber. When PM01 finally steps out of the trap, we enjoy a wonderful – if brief – view of this elegant, cat-sized carnivore in his full, soft-brown winter coat; long and slim, with strong legs and a long, bushy tail, he evokes a foxy-cat hybrid more than the weasel that he truly is. Moving light-footedly across the frozen leaves of the woodland floor, PM01 quickly melts into the background, leaving us reliant on the receiver and aerial to follow his movements via the bleeps emitted by his radio collar. Much later in the day, having left PM01 to settle into his chosen resting site while we caught up on other work, we track down his radio signal to an old stone barn on a hillside about a kilometre from where he was trapped this morning. A strong and steady series of bleeps is coming from the roof area near the east gable, indicating that our marten is enjoying a well-earned rest before heading out to forage in the woodland just down the hill. Sure enough, well after sunset we pick up his signal again in the Culliagh Woodland; but this time subtle variations in the pitch and strength of the bleeps indicate that he is moving about. We hope that he is foraging successfully for rodents or tasty invertebrates so that he can rest up with a fully belly before dawn breaks. 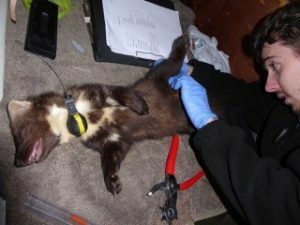 Tracking the Crom martens is just one small part of Josh’s research, which covers other study sites and other aspects of marten behaviour – all designed to improve understanding of the ecology of this enigmatic and still-recovering mammal in Northern Ireland. 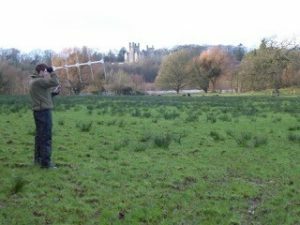 Notably, Josh has shed light on the fascinating relationships between martens and the red and grey squirrels that they prey upon; he is gathering new data on marten activity patterns and energy budgets; and his dietary studies (based on the analysis of thousands of scats – as pine marten poo is called) have revealed the unusual extent to which the martens of Northern Ireland consume invertebrates such as snails and beetles alongside their more traditional fare of rodents, birds and fruit.